1Animal Production Department, Faculty of Agriculture, Al-Azhar University Assiut, Egypt. 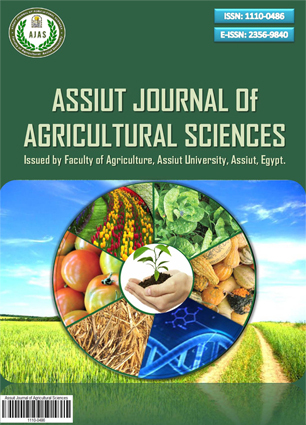 2Animal Production Department, Faculty of Agriculture, Assiut University, Egypt. This study was carried out to evaluate the effect of onion, garlic, fenugreek seeds as feed additives on feed intake, some blood plasma constituents and ruminal fermentation of ossimi ewes. Twenty pregnant ossimi ewes on day 90 ±7 of pregnancy, were randomly divided into four similar groups (5 animals each). Control group (T1) was fed the basal diet which consisted of 60 % concentrate feed mixture (44% yellow corn, 20% soybean meal, 20% wheat bran, 13% undecorticated cottonseeds meal, 2% lime stone and 1% salt) and 40 % roughages (20% wheat straw and 20% chopped alfalfa hay). While, the other three treatment groups were fed the same basal diet, supplemented with either 3% onion powder (T2), 3% garlic powder (T3) or 3% fenugreek seeds powder (T4) the rations (concentrate + roughages) were fed ad lipitum. Feed intake was recorded daily. Blood samples were collected from the jugular vein from all animals before morning feeding. Rumen samples were collected from all ewes using a stomach tube to determine ruminal pH values, ammonia-N concentration and total VFA s concentration. Feed intake increased (P˂0.05) during the late pregnancy of ewes fed onion, garlic and fenugreek seeds. While, after parturition feed intake was not significantly differ among groups except for that of onion and garlic groups at the first month of lactation, which was significantly (P>0.05) increased as compared with control. Plasma total protein and albumin levels increased (P˂0.05) in treated groups as compared with control, while there were no significant differences in plasma globulin, albumin: globulin ratio, triglycerides and glucose between treated groups and control one. Plasma cholesterol concentration decreased (P˂0.05) in ewes fed garlic as compared with those fed control, onion and fenugreek diets. Also, plasma cholesterol concentration of ewes fed onion decreased (P˂0.05) as compared with fed control and fenugreek diets. There were no significant differences among groups in rumen pH values at zero h of feeding or 6 hrs after feeding. Ruminal ammonia-N concentration decreased (P>0.05) in all treated groups as compared with control. Also, total volatile fatty acids concentration in rumen liquor increased (P>0.05) in all treated groups as compared with control one. In conclusion onion, garlic or fenugreek seeds as feed additives may have a beneficial effect on feed intake, blood metabolites and rumen fermentation of ossimi ewes. اجریت هذه الدراسة لتقییم تأثیر مسحوق البصل المجفف ومسحوق الثوم المجفف وطحین بذور الحلبه کإضافات اعلاف علی الغذاء المأکول ومکونات الدم وتخمرات الکرش فی الأغنام. تم اختیار 20 نعجه عشر فی الیوم 90±7 من الحمل بمتوسط وزن جسم 52 ±2.5 کجم وعمر من 14-18 شهر وزعت عشوائیا الی اربع مجموعات (5 حیوانات لکل مجموعه). المجموعه الاولی (م1) قدمت لها العلیقه الاساسیه والتی تتکون من 60% مخلوط مرکز و40% مواد خشنه. یتکون المخلوط المرکز من (44% ذره صفراء و20% کسب فول صویا و 20% ردة قمح و 13 % کسب قطن غیر مقشور و2% حجر جیری و 1 % ملح طعام) وتتکون المواد الخشنه من (20% تبن قمح و 20% دریس برسیم مجروش) فی حین ان المجموعات المختبره الاخری غذیت علی العلیقه الأساسیه مضافا الیها 3% مسحوق البصل المجفف (م 2) او 3% ومسحوق التوم المجفف (م 3) او3% وطحین بذور الحلبه (م 4). تم تسجیل الغذاء المأکول یومیا وأخذت عینات الدم من کل النعاج شهریا وکذلک عینات الکرش تم تجمیعها باستخدام انبوب المعده لتقدیر رقم الحموضه وترکیز الامونیا والاحماض الدهنیه بالکرش. اظهرت النتائج ان الغذاء المأکول زاد معنویا فی الشهرین الاخیرین من الحمل فی المجموعات المختبره مقارنة مع مجموعة الکنترول فی حین بعد الولاده لم یکن هناک ای تأثیر للمعاملات علی الغذاء المأکول ما عدا الشهر الاول والذی زاد فیه الغذاء المأکول فی (م 2) و (م 3) مقارنة مع الکنترول. اظهرت النتائج ان البروتین الکلی والالبیومین فی بلازما الدم زادا زیاده معنویه فی المجموعات المختبره مقارنة مع الکنترول فی حین لم یکن هناک فروق معنویه فی کلا من الجلوبیولین و نسبة الالبیومین الی الجلوبیولین او الترای جلسرید او الجلوکوز. الکولسترول انخفض معنویا فی (م 3) مقارنة مع مجموعة الکنترول والمجموعات الاخری وکذلک انخفض فی (م 2) مقارنة مع مجموعة الکنترول. لم یکن هناک فروق معنویه بین المجموعات فی رقم الحموضه فی الکرش وانخفضت الامونیا معنویا فی المجموعات المختبره مقارنة مع مجموعة الکنترول. اما الأحماض الدهنیه الطیاره زادت معنویا فی المجموعات المختبره مقارنة مع مجموعة الکنترول.